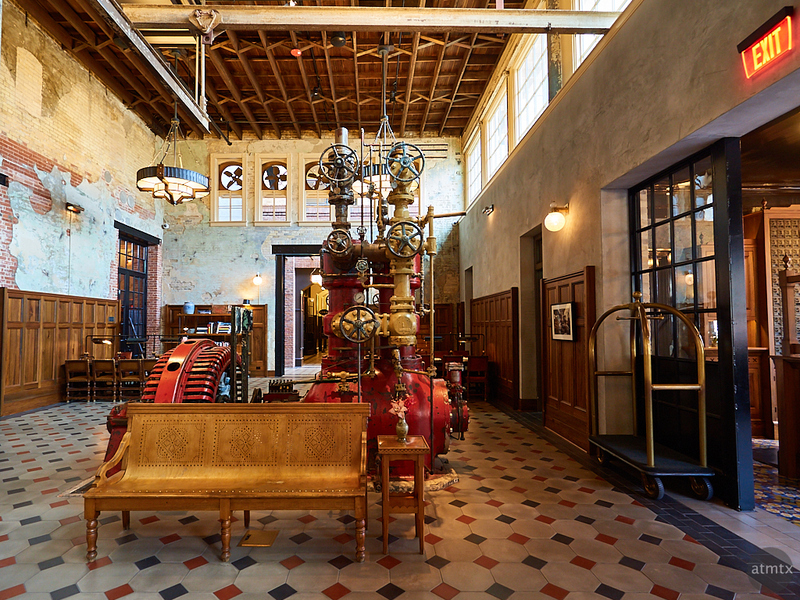 I’ve never been to a hotel lobby like this, the Hotel Emma, in San Antonio. It’s part of the Pearl District and this hotel was built from the actual shell of the old Pearl Brewery. There’s a richness and patina that can’t be duplicated by new construction. I find the industrial machinery more enticing than any artwork or sculpture. Something real, from a different era, steampunkish in all its glory. I shot this back a month ago, and here’s the photograph of the exterior, which is equally substantial. The lobby’s in glorious super wide-angle, to taking the details. It’s the kind of place that I can shoot for hours — endless angles and details. It ticks my brain for urban and architecture sprinkled with history. I’ll need to go back and document more of it. I wonder how the guest rooms look?